ARCHIVED News From The Universe Of Disney As Announced By The Mouse Himself Years 2007 Through 2009. Captain EO Returning to Disneyland! - Confirmed for California! Disney has announced the loss of Mr. Roy E. Disney today. Roy was the driving force behind a big come-back of the Disney company and feature animation in the 1980's. Read an in depth article about Roy in the LA Times here and the official Disney statement here. Our family would like to take time out to convey our sincerest condolences to the Disney family for the loss of Roy E. Disney. This is a great loss to us all and we're thankful for all that he has done to enhance his uncle's legacy. No time is easy to lose a loved one, but the holiday season is an exceptionally hard time for such an event. 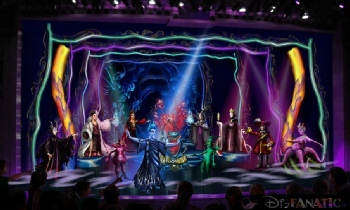 Disney has announced a brand new stage spectacular that will be heading to the Disney Magic in 2010. The show is called “Villains Tonight!” and it is the first full-scale musical production dedicated to the Disney villains. The show is a family-friendly comedy that places Disney's famous evil-doers in some irreverent funny moments. “Villains Tonight!” will premiere during the March 27 voyage aboard the Disney Magic and debut on the Disney Dream in early 2011. Toy Story - The Musical Confirmed for DCA! Disney has officially announced that August 15th 2010 will be the final performance of the Aladdin stage show in Disney's California Adventure theme park. The show will go dark to make way for the new Toy Story Musical set to open after a refurbishment of the Hyperion Theater. No word yet on whether the Aladdin show will be moved to another Disney property as of yet. This Broadway quality show, just shy of one hour, has been a favorite of the DizFanatic team. We're sad to see it go and recommend that anybody heading out to the west coast before 8/15/09 pay a visit. In our opinion, it's worth the price of a DCA admission ticket. As a side note, water screen, fire and lighting effects for DCA's new "world of Color" show have begun testing. Mickey Mouse To Return To Macy's Thanksgiving Day Parade! Disney Cruise Line announced that Mickey Mouse will return to the Macy's Thanksgiving Parade wearing a sailor suit in a fantastic new balloon! Mickey has been busy tending to his family on Thanksgiving since 2001, but he's back! This huge balloon will be filled with 14,000 cubic feet of helium and require 70 people to guide him down the streets of New York City. Someone you can really look up to at 61 feet tall, 33 feet wide and 48 feet long. To make things even better, Mickey will also be Macy's official ambassador. Macy's will be selling a plush Sailor Mickey that will speak 3 phrases as well. No Macy's near you? Order your's here today! Can't wait to get mine! The Walt Disney Company Reaches Another Major Milestone on Shanghai Theme Park Project! "China is one of the most dynamic, exciting and important countries in the world, and this approval marks a very significant milestone for The Walt Disney Company in mainland China," said Robert A. Iger, president and CEO of The Walt Disney Company. The PAR approval will enable Disney and its Shanghai partners to move forward toward a final agreement to build and operate the park and begin preliminary development work. Upon completion of the final agreement, the project's initial phase would include a Magic Kingdom-style theme park with characteristics tailored to the Shanghai region and other amenities consistent with Disney's destination resorts worldwide. Disney Releases Details and Concept Art of the new Disney Dream Cruise Ship! Disney Dream cruises will be available to book on November 9, 2009. The Disney Dream is the majestic third ship in the Disney Cruise Line fleet. Boasting 14 towering decks, a ship length of 1,115 feet and a maximum width of 125 feet, the 128,000-ton vessel includes 1,250 staterooms and has the capacity to comfortably accommodate 4,000 passengers—along with the over 1,458 Crew Members who tend to the needs of every cruise Guest each and every day. See all of the exciting details and concept art here! The Sum Of All Thrills Opening in EPCOT's Innoventions East. Slated to open soon, cast member previews began October 10, 2009 for the latest attraction in EPCOT, sponsored by Raytheon. Read more here about the details and concept art. Disney has launched a new website for the Halloween season full of cool activities, games and videos. There are many characters present, but it's nice too see that again they are bringing out the Muppets (finally) for some of their promotional media. Check it out. While not a "Stop the press" news item, I thought it would be somewhat important to mention that Disney has given the spokeswoman for the Disney Vacation Club (DVC), known as Deevy See, her own website. The site is a nice information place to introduce people to Disney's not so secret "best kept secret". It's also a nice place to get current "official" information about existing DVC properties and upcoming locations. Corny yet cute videos show you around some of DVC's newest properties. 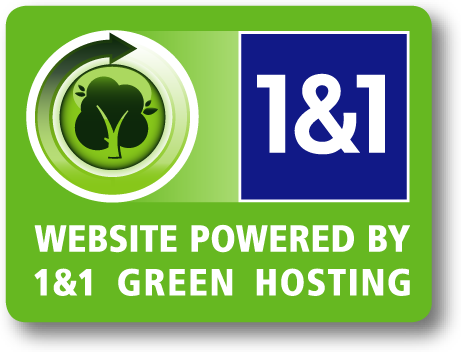 Visit Deevy See to see what DVC has to offer. Get Your FREE Children's Tickets To See Disney's Princess And The Frog! Disney Announces the "Give A Day - Get A Day" Promotion! This morning, Disney Parks announces a new program for 2010. If you volunteer. for a day at select community based organizations, Disney will give you a free park ticket to your choice of a Disneyland Resort or Walt Disney World resort theme park. Disney Officially Announces a Massive Expansion to Magic Kingdom's Fantasyland! The buzz for the Fantasyland Makeover.. IS TRUE! Expected to be completed in 2012 & 2013, this HUGE multi-year makeover of the entire Fantasyland has been green-lit and officially announced by Jay Rasulo at an exciting press conference at the first D23 Expo 9/12/09. Read all about it HERE along with the concept art. Disney (Finally) Officially Announces Star Tours 2.0 in 3D! After years of rumors, CGI leaks and Frank Oz comments, Jay Rasulo, along with Darth Vader and a battalion of Storm Troopers announced Star Tours 2.0. Jay stated that it would be opening in 2013, but Vader demanded a 2011 opening. This exciting new version will be in 3D and will contain "elements never before used in any theme park attraction." Read all about it HERE along with the concept art. Disney Cruise Line Will Sail to Alaska for the First Time in the Summer of 2011! The Disney Wonder will sail a total of 18 seven-night Alaskan cruises, departing from Vancouver, B.C., and visiting Tracy Arm Fjord, Juneau, Ketchikan and Skagway. As part of the new Alaska itinerary, Disney Cruise Line guests will be able to experience breathtaking natural vistas, an abundance of wildlife and the rich history and customs of Alaska’s native culture. Check out the video of the Official Announcement Here. Kouzzina by Cat Cora opening at Walt Disney World Resort. Cat Cora, the first and only female Iron Chef on Food Network’s hit show “Iron Chef America,” is a Mississippi native born to a family of Greek restauranteurs. She draws on the generations of kitchen “know-how” handed down in that background of different and flavorful cultures – seasoned with training at the renowned Culinary Institute of America in New York. From the wood-burning grill and oak-fired ovens of the open kitchen will come delicacies such as Greek spinach pie (spanakopita), lamb, fresh seasonal seafood and oak-grilled steak and pork. As a perfect ending to a meal, guests can try house-made Greek donuts, baklava or Greek-style coffee service. Disney Announces Agreement to Purchase Marvel Comics. With over 5,000 characters, Marvel will become part of the Disney Family. In an interview, Bob Iger stated that Marvel will continue to run as an in dependant brand but will now have access to Disney's huge distribution pathways. He also stated that the deal will honor previous licensing deals such as the 3 future Spider Man movies contracted with Sony, and the licensing of characters in rival theme parks such as Universal. Imagine that; Universal will be paying licensing fees to Disney. No immediate plans for any of these characters appearing in Disney's parks have been announced. Disney Announces Free Dining Package for Holiday Season. Great news! Disney has added their Free Dining promotion for select stays at Walt Disney World from October 1st thru December 17th 2009! Click here for complete details on Disney's site. Disney Announces Haloeewn Updates at Disneyland California. Disney announced that an overlay to California's Space Mountain loaded with ghostly lighting, projection and sound effects called "Ghost Galaxy" and will run during the Haloween season along with the "Spooktacular" fireworks show. This was done in Hong Kong last year and guests loved it. Time for another trip to CA??? Disney Announces Major Expansion to Hong King Disneyland. June 30, 2009 press release: "After more than two years of negotiations, Disney is pleased that the two shareholders have reached an agreement on the expansion of Hong Kong Disneyland that will benefit both parties. The expansion deal will contribute to Hong Kong's appeal as an international, family-friendly tourist destination and the resort's long-term success," said Leslie Goodman, Executive Vice President for Worldwide Public Affairs, Walt Disney Parks and Resorts. "Disney is making a substantial investment in this important project and we are eager to begin work as soon as the necessary approvals are received." For more information and renderings see our HK Disneyland Expansion page. The rumors were true and the tarps have come down over at Pixar Place. Now an animatronic Luxo Jr. will greet you at the entrance to pixar place with intermittent appearances with alternating shows. Each performance is approximately 3 minutes and shows every 15 minutes. There are even different shows for day and night. A friend sent a youtube link that you can see over on the Mouscelaneous” Videos” page showing various performances. 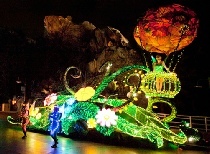 On June 5th, Disney rolled back out the Electrical Parade at Disney's California Adventure Park with a band new addition. My girl, Tink, gets the attention she deserves as she greets fans from her very own float. 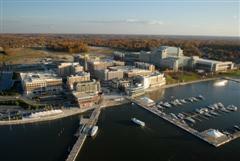 The Peterson Companies announced today the sale of land at its National Harbor development near Washington, DC to Walt Disney Parks and Resorts for $11 million. 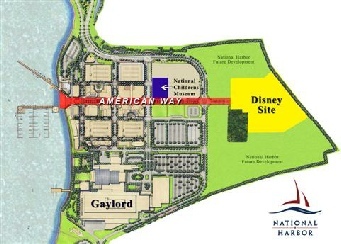 Disney is considering using the 15-acre site overlooking the Potomac River in National Harbor, MD as the location for a resort hotel for families and others visiting the National Capital Region. Read more at the official National Harbor Website. Characters in Flight Now Testing. The new Downtown Disney "Characters in Flight" tethered balloon ride prices have been posted as $16 for adults & $10 for children. The big balloon & basket have been installed and is testing testing. FREE DINING PLAN IS BACK!!! Yesterday, Disney announced and started running television ads for the FREE DINING PLAN promotion. Customers who buy a five-night/six-day room and theme park ticket package for stays between Aug. 16 and Oct. 3 will receive meals as part of the deal. The meal plan offers one quick-service meal, one snack and one table-service meal at the more than 100 restaurants for each night of the package. Reservations must be made by June 21. Exciting Toy Story Mania News! While Toy Story Mania may be one of the first true combinations of a video game and theme park ride, the official Toy Story Mania video game isn’t far behind. This week Disney Interactive announced that Toy Story Mania!, a new video game inspired by the rides at Disney’s California Adventure and Disney’s Hollywood Studios theme parks, will be released exclusively for the Nintendo Wii this fall. The Disney Cruise Line has announced it plans to move the Disney Wonder cruise ship from its Port Canaveral, Florida home base to the Port of Los Angeles in 2011. The company is working with the West Coast port to finalize a two-year agreement with a three-year extension option. Disney is presenting the relocation as part of an overall expansion plan. It will put two new ships, Disney Dream and Disney Fantasy, at Port Canaveral in 2011 and 2012, respectively. The two ships are under construction in Germany. Each will have 1,250 staterooms and will weigh 128,000 tons. When in service, they will more than double Disney Cruise Line’s passenger capacity. After the first three blockbuster movies, grossing over $2.6 Billion in the box office, we knew that Captain Jack Sparrow would not leave us without hope for any future adventures. While rumored for a long time, Mr. Mouse has finally admitted inking a deal. Jerry Bruckheimer will be overseeing the production. No release date is set. So lets celebrate! Where's the rum? As a side note, Mr. Depp will also be playing Tonto in the upcoming Lone Ranger film, also overseen by Mr. Bruckheimer. He will also play the Mad Hatter in Tim Burton's adaptation of Alice in Wonderland. Gonna need more Rum for that one. Both the Disney Magic & Wonder have recently been equipped with Digital 3-D projection systems in the Walt Disney & Buena Vista theaters. They have also added Laser, Fog, streamers and other effects to create a truly immersive experience. Steel cutting has begun for the 2 new ships, scheduled for it's maiden voyage in late 2010 - early 2011, and Disney has officially announced the names as The Disney Dream & Fantasy. The designs for the significantly larger ships will include some new thrill such as a clear water slide that will take you for a ride outside of the ship's perimeter. Disney Vacation Club's new Hawaii Resort is on track for a 2011 opening. Click HERE for updated info and photos of the scale model at the bottom of the page. Disney Vacation Club has announced 2 more Villa resorts (we all heard the rumors) today! Click HERE to read the full story with renderings and video. Pirates of the Caribbean Beach Resort! Walt Disney World has unveiled a rendering and a few details of some retheming and renovations in the works for Disney's Caribbean Beach Resort -- theming it after the hugely-popular Pirates of the Caribbean ride/movies/games franchise. Beds that look like ships. Dressers that look like old crates. Curtains that look like tattered sails. The attached artist's rendering shows a few of the details. Disney is planning the look for 384 rooms in the Trinidad South Village Area, set to be ready sometime next year. The resort has a total of 2,112 rooms. Yack & Yeti To Open November 14th. The new Yack & Yeti restaurant is set to open for business. Anybody headed down next week? Toy Story Mania Added to WDW Site. Disney Announces Major Expansion to DCA! Disney has officially announced Major expansions to Disney's California Adventure Theme Park!!! Many of those exciting rumors are now official news!. Luxury family resort planned for Ko Olina Resort & Marina on the island of Oahu.